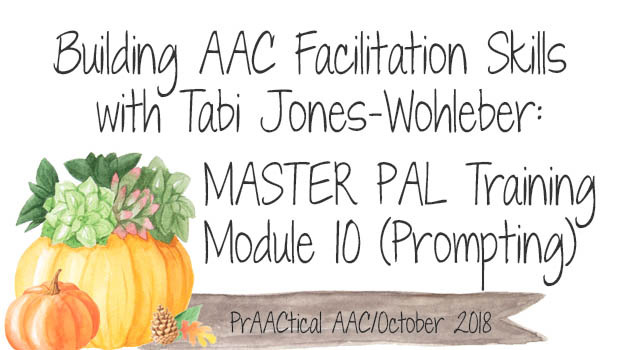 Welcome back to our AAC partner training series, Model as a MASTER PAL, created by SLP Tabi Jones-Wohleber. Today, we continue with materials to help communication partners interact with AAC learners in a supportive fashion. This module covers a lot of territory. From the behaviors of communication partners that support the process of language development to creating communication opportunities, to the language we use with a child to talk about their device, to fostering communicative competence, naturalistic engagement is shaped in many ways. The importance of this conversation lies in the fact that genuine engagement and mutual respect are where learning happens. It is also how meaningful social relationships are built. This module invites participants to reflect on factors that shape the quality of interactions in order to maximize the potential for communicating, learning and creating meaningful social, emotional experiences. Here are some things you will need for Module 7. PUZZLE Slide 11 is an Interactive Slide. Give participants the opportunity to brainstorm phrases that may occur during puzzle time. Validate responses. Show sample phrases on the slide. Discuss the variety of pragmatic functions represented (requesting, describing, commenting). Note the predominance of core vocabulary. SNACK / LUNCH Give participants the opportunity to brainstorm phrases that may occur during snack/meal time. Validate responses. Show sample phrases on the slide. Discuss the variety of pragmatic functions represented (requesting, asking, commenting). Note the predominance of core vocabulary. These examples include few questions, and use a variety of vocabulary for a variety of purposes. This is in contrast to many interactions with AAC users. For example, during puzzle or snack time, interactions are often characterized by the communication partner saying “What do you want”, and the AAC User indicating “more” or “(color word)”. The conversation goes back and forth in this way with little variation. While this may be a useful strategy for a moment (to establish a back and forth in an interaction), it quickly becomes boring, and either interest decreases or the individual habituates to the interaction which fosters prompt dependence on the communication partners cue to respond. Variety is imperative to foster naturalistic interactions, sustain interest, and teach language and communication for a variety of purposes! Interaction patterns that foster language development 13-15 Examples of how adults interact with babies, toddlers, and young children to foster language skills. Caregivers do this naturally, with little thought about the role their behavior plays in helping a child learn to understand and use language. These strategies are also used with second language learners. Specific examples of child and caregiver interactions. 16 This is an interactive slide. Specific examples of how caregivers respond to early communicative attempts by young children. The strategies described on slides 13-15 are evident in these examples. The child’s phrases were also used in the previous section, Time, to demonstrate how the use of core and fringe vocabulary naturally develops and evolves. Anatomy of a conversation 17-18 Another aspect of naturalistic engagement is creating opportunities for reciprocity and the give and take that occurs in communicative interactions. Even if the student does not take many (or any) turns, providing openings for those opportunities, and modeling what it looks like is an important component of fostering language development. Per-Opportunity-Words 19-23 Core Vocabulary makes up approximately 80% of what we say. Core words can be multi-meaning and used across contexts. Core vocabulary fosters natural interactions. These 2 approaches may be used to systematically teach core vocabulary and AAC because they lend themselves to ample modeling and naturalistic engagement. Applying Word of the Week 24-25 An interactive activity in which the word “look” is applied in WOW and POW contexts. The underlined WOW & POW on slide 24 links to a screenshot of a communication display with the word “look” highlighted. This may be useful to spark ideas for this activity. Natural interactions are respectful interactions 26-29 Natural interactions can only occur when a student feels respected and valued by his communication partner. Slide 27– most students will be influenced by more than one of these examples. The focus here is to attend to a child’s individuality and respond accordingly, whether it be driven by one main component or several. Invite participants to think about their own students, children or others in their life. They will likely identify these characteristics with specific individuals whom they know…maybe even themselves. A word about emotional competence 30-33 Emotional competence develops over time and in tandem with language development. These slides provide information and considerations for using emotive experiences to teach language related to those experiences. It is important to understand that behavior is communication. When an individual does not have a means to communicate, behaviors often emerge. Too often our responses to these behaviors are disciplinary, dismissive, or the behavior is “managed”, forfeiting opportunities to connect with students and teach the language needed to validate their experience and provide the words they need to begin to understand and process their emotions. Think about this. 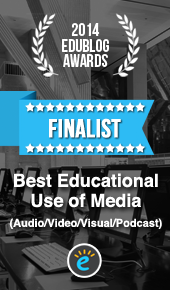 When we (as competent communicators!) need to “vent”, our language is cumbersome, disjointed, emotional, exasperated, sometimes incoherent, repetitive. But as we “talk it out”, we begin to make sense of things, assign logic, and generate more concise explanations. Talking it out gets it out of our head so we can process and begin to understand how and why we feel what we feel. Helping students assign words and meaning to their emotions and experiences (good and bad) is imperative to develop emotional competence. Closing Thoughts 34-35 Explained on Slides. 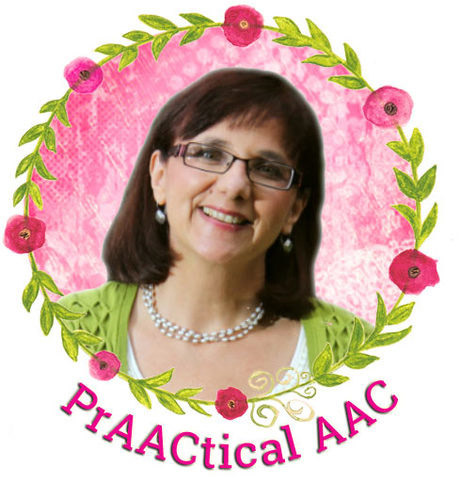 AAC is an umbrella term-it means many things. ALL language is learned through modeling (developmentally, foreign languages, AAC, etc.). Typical language development is our guide for teaching AAC. Communication partners foster language by repeating, recasting, extending and providing natural responses. Core vocabulary is our go-to vocabulary for natural interactions. Natural engagement means supporting emotional competence with compassion and by modeling language to support understanding. Na, Ji Young & Wilkinson, Krista & Karny, Meredith & Blackstone, Sarah & Stifter, Cynthia. (2016). A Synthesis of Relevant Literature on the Development of Emotional Competence: Implications for Design of Augmentative and Alternative Communication Systems. American Journal of Speech-Language Pathology / American Speech-Language-Hearing Association. 25. 1-12.